Oundle Town Under 16s in action. Two Peterborough & District Youth League title races were decided yesterday (April 30). 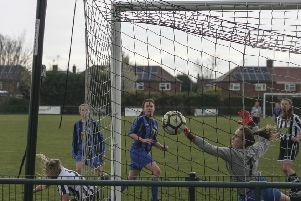 Thorpe Wood Rangers claimed the Under 16 Division Two crown with a 4-0 win against Bourne Town while Oundle Town’s 3-1 success against Boston United Community FC earned them the Under 16 Division Three title. Cameron Guest (2), Callum Boyes and Ibrahim Sankare were the Thorpe Wood scorers while on target for Oundle were Joseph Murphy, Matthew Bonnett and Thomas Filby. The Under 18 Division Two title race will go right down to the wire. Yaxley Lynx won 4-2 at Bourne Town Claret with goals by Matthew Dale, Jordan Harris, Liam Hatfield and Lewis Wright to take over at the top from long-time leaders Peterborough Sports. They have a two-point advantage and it’s now a winner-takes-all clash between Yaxley and Sports in the final fixture at Yaxley on May 14. Top two in Under 18 Division One both suffered defeat yesterday. Leaders Bourne Town Red came unstuck 3-0 at home to Glinton & Northborough Amber, for whom Robbie Ellis (2) and Matthew Smith netted, while second-placed Northern Star lost 2-1 at home to Deeping Rangers Blue. March Soccer School kept their Under 18 Division Three title hopes alive by romping to an 8-1 win over Deeping Rangers Claret with Robert Conyard scoring four times. March and Oakham are now level on points at the top with one game each left to play. Under 15 Division One champions Peterborough Sports remain on course to complete their season unbeaten. They won 5-2 against Glinton & Northborough Amber with goals by Jazleigh Fife, Bradley Gilbert, Tychique Muendo, Nasir Nabi and Jay Ward to make it 14 wins from 14 games. They have two remaining matches. Deeping Rangers Under 16s beat Malborne United 4-0 with goals by Harrison Dee, Alexander Moroz, James Pam and Nathan Pickering to remain in contention for the Division One title. They are level on points with Northern Star and the two clash on Sunday (May 7) at Star. Deeping have already won the League Cup and the Linconshire County Cup.